David is a DPhil student at the School of Geography and the Environment, where he works in the Oxford Climate Research Lab. He holds a BA in Geography (First Class) from Keble College, Oxford, where he specialised in climate variability, climate impacts and desert landscapes. He earned the Gibbs Prize for the best Finals performance, and the H.O. Beckitt Prize for the best physical geography dissertation on East African rainfall. He also holds an MSc in Applied Meteorology (Distinction) from the University of Reading, where he specialised in climate change, tropical meteorology, statistics and environmental data. For his DPhil, David aims to develop an understanding of the land surface controls on Central African rainfall. Erroneous simulation of these controls is likely a contributing factor to the inter-model spread in rainfall amount and distribution. The aim of David's project is therefore to examine whether inter-model differences in land surface variables might affect inter-model differences in rainfall distribution and amount during the Central African wet seasons. 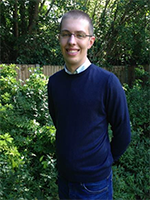 David is interested in other aspects of weather and climate alongside his DPhil. In 2017, he completed a three-month summer placement at the Met Office in Exeter, where he set up a new night time only configuration of the Met Office OSTIA sea surface temperature analysis system. He produced a technical report of the new system for the Met Office, and aims to write up the report as a short note to the Journal of Geophysical Research. School of Geography and the Environment, University of Oxford, South Parks Road, Oxford, OX1 3QY, UK.